for Super Real Weight Loss. 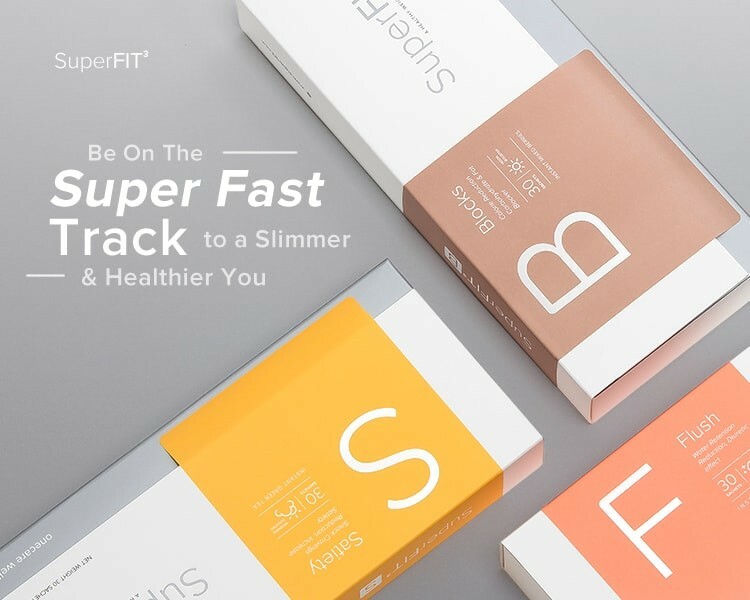 The SuperFIT3 product series is the perfect slimming plan that is uniquely designed to bring positive changes to your body during its ‘magic hours’ by naturally diminishing your food cravings and hunger pangs in the morning, blocking excessive carbohydrate and protein in the afternoon, and eliminating excessive water and toxins during nighttime. 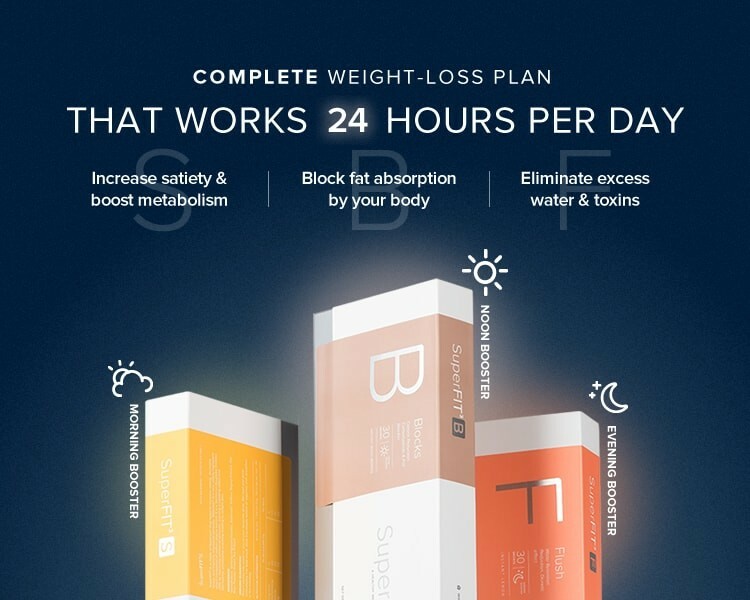 SuperFIT3 is specifically designed to best cater to how your bodyfunctions at different times of the day, allowing you to shed those unwanted body weight and keep them off for good. Satiety promoting effects decrease compulsive snacking and hunger pangs throughout your day! Prevent or delay the absorption of excessive carbohydrates and fat in your digestive system. Inhibiting the enzymes needed to break down carbs,including alphaamylase & lipase, hence reduce excessive calories intake & fat storage during lunch. so you can stay in shape effortlessly! 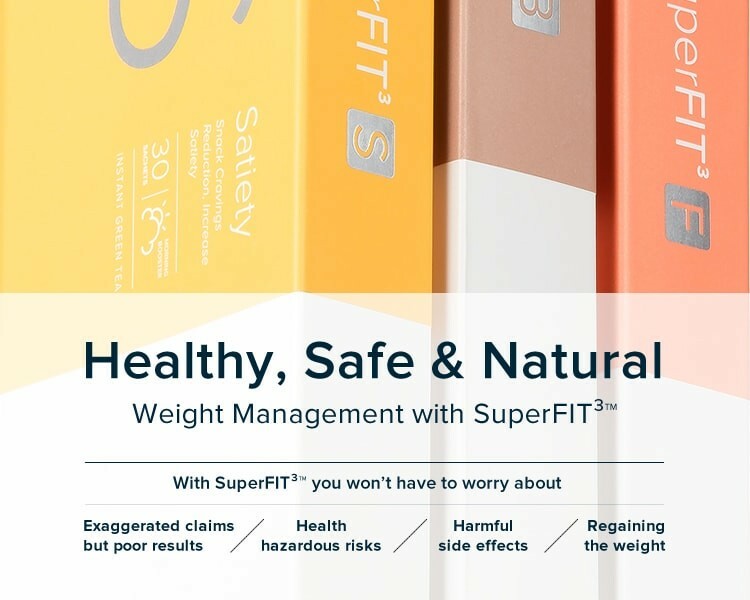 SuperFIT3™ utilizes carefully selected ingredients to customise and create uniquely formulated solutions that gets to the root of your weight problem. Unlike generic weight management products that typically blend uncalculated ingredients in hope of producing a blanket solution without taking into consideration the real underlying causes behind your weight problem. 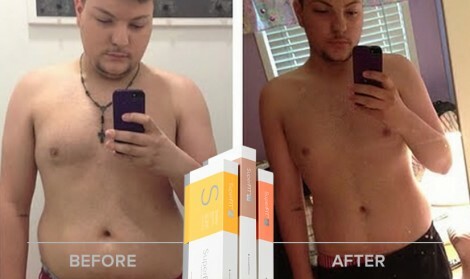 Track your results with Before & After photos. Weight yourself and take measurements of your thighs, hips and waist. Constant snacking between meals is proven to be one of the major stumbling block to maintaining a healthy diet and desirable figure. SuperFIT3™ S (Morning Booster) is a breakthrough formula that reduces your snacking cravings and impulses, effectively minimizing any unnecessary calorie intake. SuperFIT3™ S is rich in Satiereal™. Studies has shown that Satiereal™ significantly reduces one’s cravings to snack, decreases behaviour. The green tea extract in SuperFIT3™ S contains epigallocatechin gallate (EGCG) that boosts your metabolism rate and promotes fat burning. EGCG is also what makes green tea a scientifically recognised superfood with multiple anti-aging and disease-fighting properties, rids your body of free radicals while recharging your energy level. 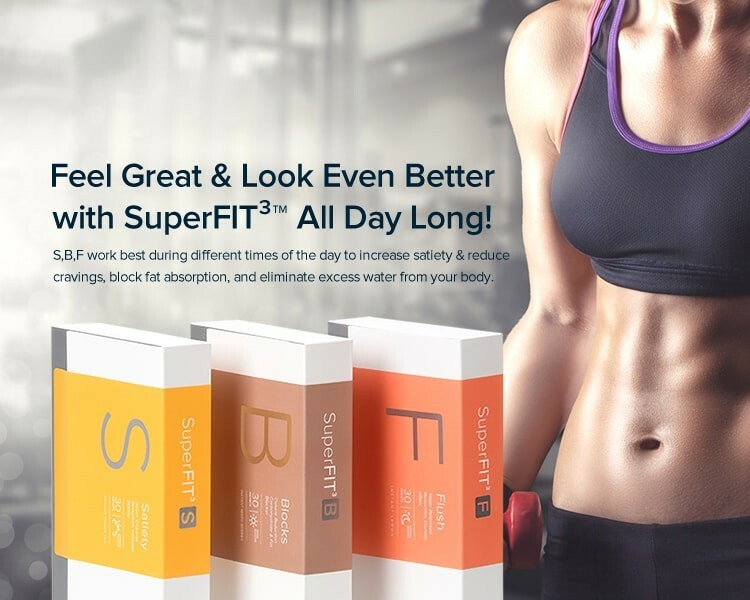 SuperFIT3™ B (Noon Booster) incorporates active ingredients that help inhibit the breakdown of fats and particular carbohydrate molecules so that your body is less likely to absorb them. SuperFIT3™ B reduces carbohydrate and fat assimilation by controlling and reducing calorie intake and fat storage while giving your immune system a much needed boost. The highfibre PromOat® content helps to increase satiety, leading to a reduction in unnecessary food intake. It also binds excess cholesterol, preventing them from being absorbed into the body and clogging your arteries. Fluid retention is a deficiency in the drainage of lymphatic system and can affect many areas of the body, causing discomfort and temporary weight gain not only for women, but men as well. 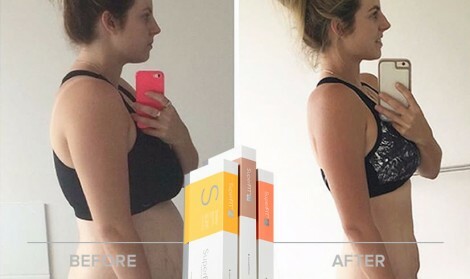 Cacti-Nea™ in SuperFIT3™ F contains antioxidant, diuretic and detoxifying properties that facilitate the elimination of excess fluids from your body without excessive mineral loss, resulting in a slimmer figure within just weeks. SuperFIT3™ F incorporates Guarana Seed Extract that can improve your mood and boost your metabolism, as well as reducing water retention that causes cellulite through its diuretic effect. 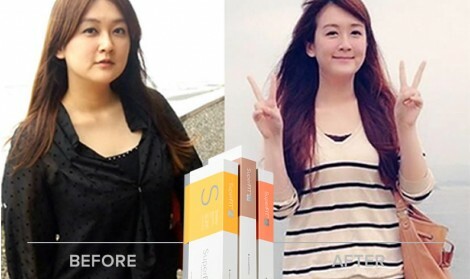 So you can feel better, look slimmer, and say goodbye to orange peel skin! Say goodbye to those conventional unpalatable slimming teas or diet supplements. SuperFIT3™ comes in highly concentrated yet easy-to-dissolve powder form. makes losing weight fun & easier than ever! Contains naturally sourced smart sugar-- Palatinose™ that is very slowly digested to release glucose into the bloodstream in small quantities that won’t cause excessive insulin peak. It provides a balanced and sustained source of energy for long period, contributes to healthy metabolism, improves fat burning, as well as supports dental health. 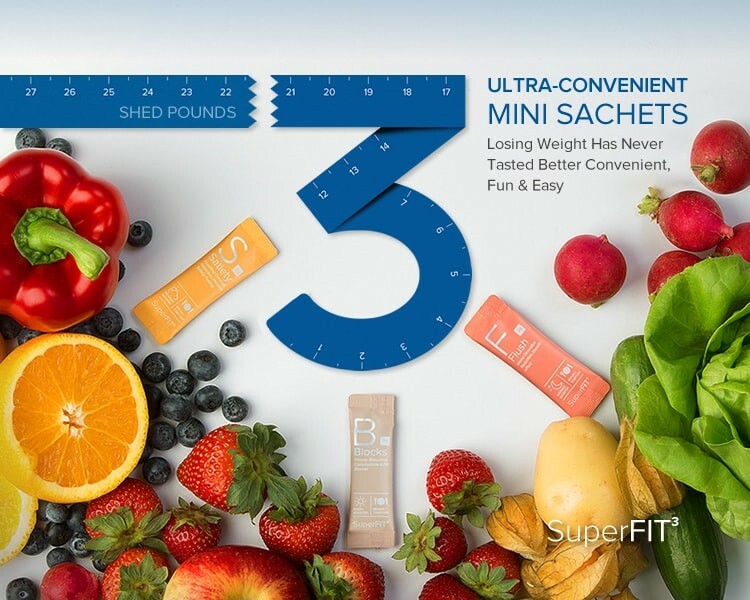 SuperFIT3™ comes in chic and ultra convenient mini sachets that easily fit into your pocket, purse, or even wallet so that you can enjoy it wherever you go. Its compact packaging makes it ideal for work, going out, or even travelling. Simply grab a few mini sticks along with you in your work bag, gym bag or handbag, so that you can mix it into your bottle or sipper and drink it while you workout, or mix it with your tea or coffee while you’re chilling at a cafe with friends. 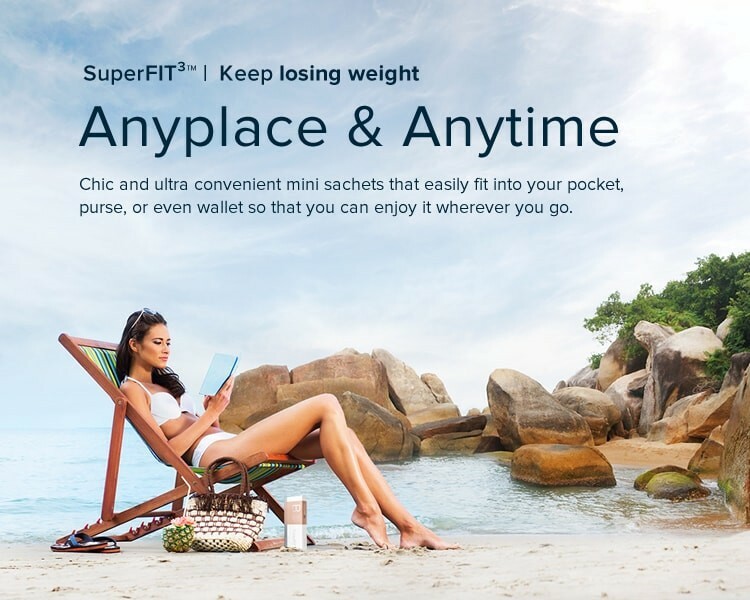 SuperFIT3™ allows you to keep losing weight anyplace and anytime. Detrimental to mental & physical health. Caffeine has been associated with heart palpitation, mood swings, anxiety, irritability and insomnia. Plus, it is not scientifically proven to help with permanent weight loss. Laxative leads to diarrhoea, abdominal pain and malnutrition. Long term usage may decrease your colon's natural ability to contract and actually worsen or lead to constipation. Hidden drug ingredients such as prescription drugs, controlled substances, and untested/unstudied pharmaceutical ingredients could lead to dangerous side effects, heart attack, stroke or even cancer. Unknowingly, you may be taking products laced with terribly harmful ingredients, plus once you stop taking them, your weight will bounce back with a vengeance! 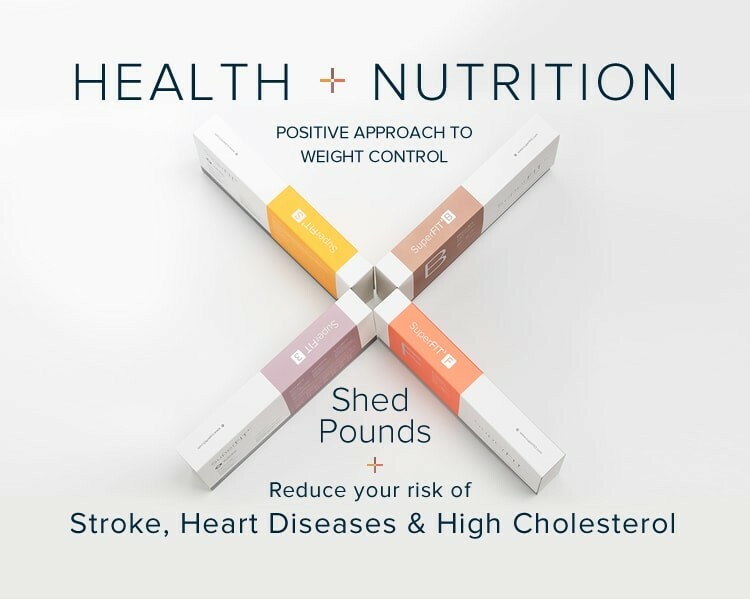 achieve your ideal weight and shape. 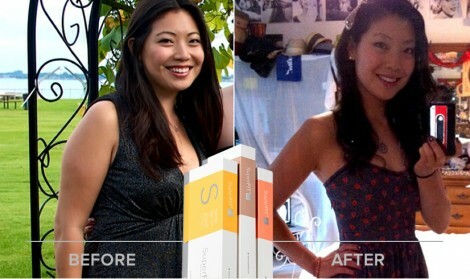 by sending “before and after” images of yourself, and tell us how the SuperFIT-3™ series became a part of your life. REBATE of your previous purchases! All submissions are subjected to our approval. We reserve the rights to reject submissions which are deemed inappropriate or do not meet the criteria. Photos must be clear or, at the least, of acceptable image quality. 'Before' photos can be that of which were taken at any period of time prior to taking our products. 'After' photos must be of subject with our products in hand. Any submission of only 'After' photos without 'Before' photos, or photos where the face is cropped or not clearly shown, will be eligible for a 50% refund in the form of cash vouchers that will be valid for a period of 6 months or more. Please kindly allow us at least 7 business days to process all submissions. Please inform us in the form of 'Additional Remarks' if you would require us to take relevant measures to anonymise your photos for privacy purposes. Do not attempt to alter submitted images through pixelization in any form prior to submission. Reward/Rebate will be given in the form of cash vouchers that will be valid for a period of 6 months or more. The cash voucher can only be used to purchase any product from the SuperFIT™ series, and each customer is allowed to claim not more than 4 months' supply.By submitting the above, you acknowledge and agree to the above terms and conditions. Once received and approved, all submissions will become the property of Onecare Wellness and may be used or published in any form that is deem suitable. By submitting the above, you acknowledge and agree to the above terms and conditions. All testimonials can be found at SuperFIT-3™ official Facebook page, all comments are from our satisfied customers with their real profile. Stress will definitely cause me to age faster and gain weight a lot! 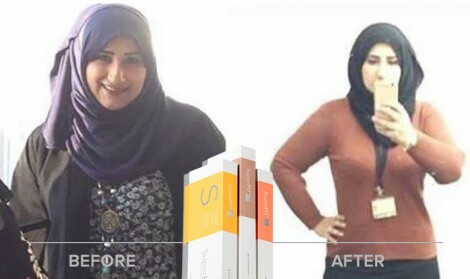 Thankfully, SuperFIT3 Slimming Plan is here to bring positive changes! SuperFIT made it happen! After staying with the program for 4 months, I have lost a total of 19 pounds and counting! I've been losing weight twice as fast as before I had SuperFIT! I love how easy it is, I love the taste, I love that it’s natural, and I love how it helps me to lose weight and feel great while doing it! SuperFit does the power so you can manage your hunger, maintain a healthy metabolism and feel energised as you lose those unwanted kilos. If you've tried to lose weight before and failed, take heart. SuperFit does the power so you can manage your hunger, maintain a healthy metabolism and feel energised as you lose those unwanted kilos. SuperFit is simple, easy-to-follow and delicious too, offering you everything you need for lasting weight-loss success. 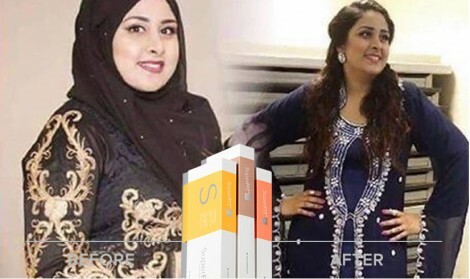 I have really enjoyed using SuperFit for my losing weight journey. Wonderful program and easy to use and follow! I have really enjoyed using SuperFit for my losing weight journey. I used to exercise frequently to stay fit but after I have stopped for a few months, I have gained weight. This has really helped me get back on track. Wonderful program and easy to use and follow! Strongly recommend to friends and family! You can see the improvement in about 2 months. No radical change but best to eat balance. You will automatically eat less, sort like a mechanism to lose appetite. I had tried Superfit! You can see the improvement in about 2 months. No radical changes in your diet is required but best to eat balance. You will automatically eat less, sort like a mechanism to lose appetite. So far there is no any allergic to certain ingredients of it. The natural way, and the hardest way is better to diet sensibly and exercise.. Good Luck!! 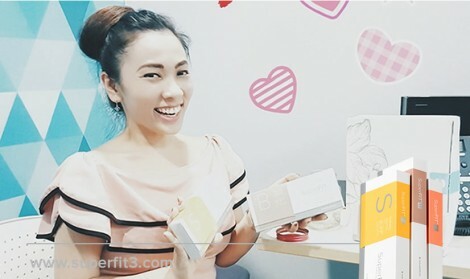 I took Super-FIT for my 4th month now and it still working good especially for medication consumer like me which are hard to find for weight loss product and it taste good too. No palpitations, headaches nor difficulty sleeping. After taking SuperFIT as recommended by my gym mate, the results were quicker than I expected! I've lost 14 pounds over just a period of 3 months. After taking SuperFIT as recommended by my gym mate, the results were quicker than I expected! Along with my regular workout routine, I've lost 14 pounds over just a period of 3 months. Thank you SuperFIT for helping me achieve my weight loss goal faster! SuperFIT kickstarts my metabolism and enables it to burn twice the calories. Plus it gives me this consistent surge of energy throughout the day! 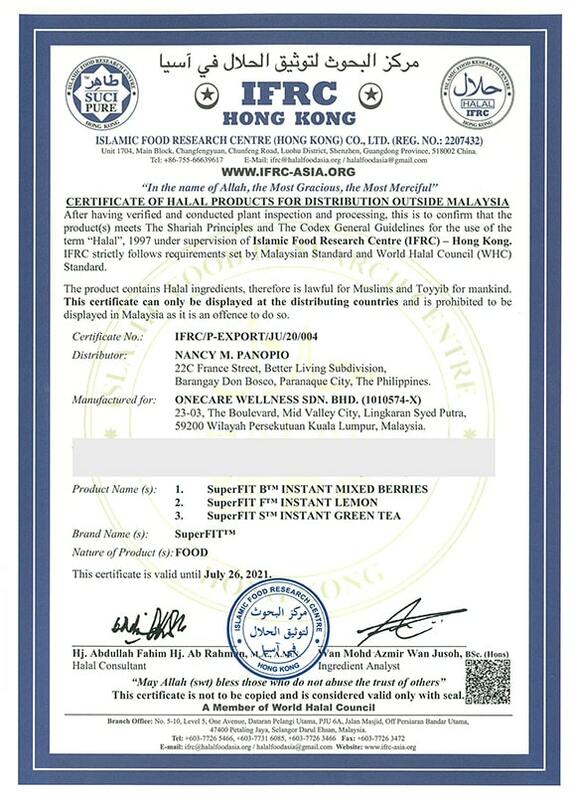 From extract of Crocus sativus L.
- Satiereal® is a trademark of Inoreal, France. - ID-alG™ is a trademark of Nexira, France. From extract of Paullinia cupana. Provided 0% calorie. Clean-label from Tate & Lyle. - Cacti-Nea™ is a trademark of Nexira, France. - SPLENDA® is a trademark of Tate & Lyle, Sweden.